GO CARTER and the COBRA’s! Our kids are pack-rats. Plain and simple. They don’t have a “favorite toy,” or a lovey they have to have, but they do like hoarding stuff from one fort or tent or house or cubby spot to another. Today, it was a fort. Carter made a fort out of blankets, held down by piles and stacks of books, in her room. She made it so that you could only get in by going under the bed (so WE couldn’t get in! ), and she stocked with with books, flashlights, their Dream Lights and bears, pillows and blankets. 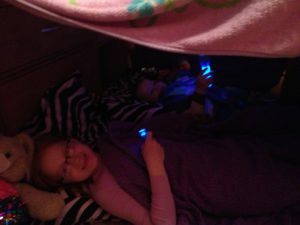 She kindly made sure that both she and Charlie had cozy spots to sleep in, then begged to sleep in the fort. It was Saturday. We agreed. At 9pm, we called lights off. Carter was tired, but Charlie never gives in! She tired to get him to stop talking and turn off his flashlight for at least 20 minutes. Then, she just gave up and conked out! He kept chattering away. When I checked on them at 10:45, they were both, FINALLY!, asleep. When Andy checked on them again Sunday morning, around 7:15, they’d both retreated to their own beds at some point in the night! Sunday, the fort became a tent, then an apartment. Nerds! These dorks couldn’t be happier in their fort!